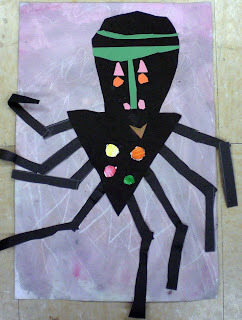 Students in Ms. Sortino’s K art class read the book, Anansi the Spider by Gerald McDermott. It is a well-known story from the people of Africa (Ghana). Anansi is a folk-hero to the people of Ghana and the students read about his tumble into many troubles, and his 6 brave sons who rescued him. Each student created their own spider out of construction paper and then picked which son they wanted to make their spider by adding that son’s personal symbol on their spider. 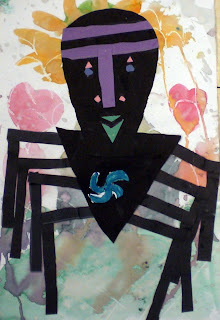 Students also practiced the African tradition of batik by creating their spider webs out of a water color and crayon resist technique.